Home / BLF Live / BLF 2014 Reports / BLF 2014 Reports Day 1 / Whose Language is it Anyway? The prime topic of discussion in this session quickly evolved into considering whether Hindi should be made compulsory in India and if it should become the administrative language as well. 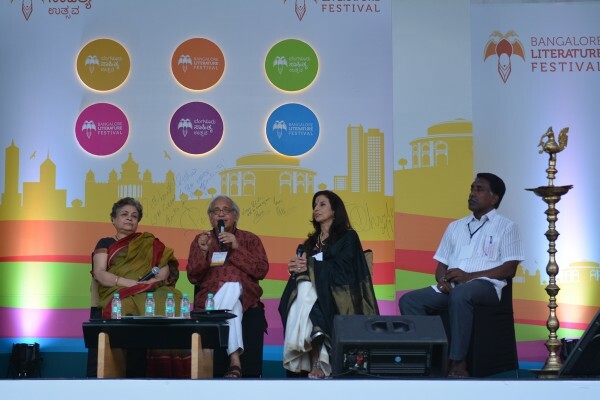 The esteemed panelist in the sessions included renowned television personality, journalist, and author Mrinal Pandey; literary- critic, essayist, and Indian poet Ashok Vajpeyi, Indian novelist and columnist Shobhaa De, and Tamil writer, novelist, and documentary film director, Joe D’Cruz. Mr. Ashok Vajpeyi opened the discussion, stating that there were primarily two questions we needed to ask in considering whether Hindi should become our official language. First, what is the current capacity of people all over the country to conduct official work in Hindi. For whom other languages are more predominant, would they ever be in a position to navigate Hindi with dexterity, if it were to become the official administrative language? “’Official language’ is a very small part of language and it is not the most creative, nor the most popular. It is the furthest from spoken language,” he contends. Speaking from his experience as a civil servant, Vajpeyi stated that 80 per cent of his work was quite routine and tedious. Given that carrying out the task of Hindi-izing administrative work would involve translating from one’s native tongue, this policy would only further overburden civil servants and the process of translating itself might add more errors and confusion. She provided insights into how social media expanded the dynamics of language and how the young are proud to have mastered the art. Author and director, Joe D’cruz, questioned whether government administration in a particular language meant that it would become a vehicle for them to contribute to it. For example, even though Tamil Nadu controls the state with Tamil, does it contribute to the language? Mr Vajpai attributed the preservation of regional languages that has happened thus far to the credit of translated books. By making regional wisdom more accessible to readers beyond the region, the national push for and awareness about propogating regional languages has gained momentum. Now, a Gujarati or Kannada author is known in other parts of the country. For example, take the word “Rail Gadi” where the work “rail” was borrowed from English and added to the Hindi word for vehicle. “As a Hindi writer, as a Hindi journalist, and as the daughter of a Hindi writer, I am really upset about Hindi being made the official language”, said Mrinal Pandey. She also pointed out the legislative hurdles to be faced in making this a reality. According to the Constitution, unless non-Hindi speaking states agree, Hindi cannot be made the official language of the country. Speaking as a writer and translator of several books, she believes the DNA of languages are the same and that not much is lost in translation. Somehow, we’ve chosen to overlook that a third of the Indian population lives in poverty. Why is this not more a matter of disrespect rather than the concern that not speaking Hindi will makes us lose face. By the end of the discussion, the panelists concurred: Hindi should not be imposed upon the nation. Rather, the richness of each language should be embraced and allowed to evolve. Across the board, panelists resist the imposition of Hindi across the nation.